Julie Taymor, a unique visual artist, creates a musical framed by the great songs of the Beatles. It's ambitious story with a few innovative sequences, but unfortunately it's peppered against a dull narrative with two-dimensional unimaginative characters. The film introduces Jude (Jim Sturgess) a Liverpudlian shipbuilder who travels to America to find the father he's never met. After he finds him working at Princeton University he makes friends with Max (Joe Anderson) a privaleged but rebellious youngster. Meanwhile, Max's sister Lucy (Evan Rachel Wood) back home in her boring old small town moves to New York City to hang with Jude and Max. The three of them bunk up in a communal bohemian apartment where they meet several other lost souls who will eventually 'find themselves amid the political turmoil of the 60's. A love story between Jude and Lucy takes over glued together by the power of the Beatles songs. Taymor certainly captures the spirit of the Beatles music - peace, love, war, protest etc etc. But the narrative and characters that give birth to the musical sequences are just too on the nose and obvious. Imagine the opposite of "I'm Not There". Todd Haynes' film had the same desired result - a visualization of a great artist and his songs. Though I found Haynes' film too impenetrable to grasp the deep meaning of his life and music, "Across the Universe" is on the other end of the spectrum - a paint-by-numbers version. There's a simplistic 'bullet-pointing' of the time period. There's a Vietnam War sequence feels rushed and pefunctory and the characters Sadie and Jojo who are too obviously look-alikes for Janis Joplin and Jimi Hendrix. Julie Taymor is careful to craft each scene/song with it's own style whether it's the neon-lit bowling alley, the giant Lion King-esque puppets, dancing black-suited office workers on lunch etc. The one fundamental flaw is that the Beatles songs are so perfect and so cherished that I found the actor's cover versions uninspired. "Across the Universe" is a film that looks better as a trailer than a feature length film - at 130 mins, it's way too long for what should be a short and sweet psychedelic musical. 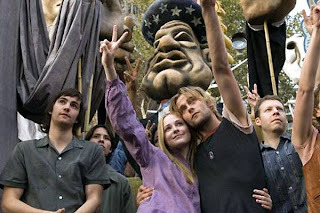 "Across the Universe" is available on DVD from Sony Pictures Home Entertainment. I just saw this on the plane last week and totally agree. The story reminded me of the very forgettable '1969', with Kiefer Sutherland, Robert Downey Jr. and Winona Ryder. While some of the sequences were imaginative, and some versions of the songs came off all right, the motivations for the songs were laughably thin. Case in point, a more or less useless character named 'Prudence' just happens to lock herself in the closet, causing the characters to break out into 'Dear Prudence, won't you come out to play?'Bleech. I was waiting for someone to eat a hamburger and sing Mean Mr. Mustard. Still, it passed the time on the plane well enough... But not as well as Mr. Woodcock, which is saying something. sorry patrick, but are you blind or just stupid? I beg you, please pay attention to the symbolism when watching true art! Actually, I'm a bit of both. I suppose you'll tell me next that her being locked in a closet was significant?